As Obama and Romney debate offshoring, many commentators have pointed out that estimating the total job loss from offshoring is difficult. However, we can answer a different but related question: How many manufacturing jobs could we bring back if we closed the trade deficit? A recent analysis by the Progressive Policy Institute, Manufacturing in the App Economy, showed that closing the trade deficit would add roughly 3.5-4 million direct and indirect manufacturing jobs,raising total manufacturing employment to about 15.5-16 million, or 2001 levels. There would be a cost, equalling a one-time rise of 1.8-2% in overall economy-wide prices, but that seems manageable at a time of low inflation. What’s more, the U.S. will be borrowing a lot less. Obama should adopt the goal of bringing back 4 million manufacturing jobs as one of the key goals of his campaign. It’s very achievable, and can only benefit Americans. We as a country need to pay more attention to innovation and production across every sector of the economy, including manufacturing. Our goal should be to create a balanced economy. That means producing as much as we consume; sustaining our standard of living without taking on loads of debt; and excelling in both tangible industries, such as manufacturing,and intangible industries, such as healthcare and computer programming. The moral of the story: Why we need to spend more money on economic statistics, not less. For the past couple of years, the BEA and Census Bureau have been reporting an apparently odd fact: Domestic computer manufacturing was not only alive but growing. To be specific, until last Friday the official numbers were showing that domestic computer makers shipped almost $50 billion worth of computers from U.S. factories in 2011, the highest level since 2001. 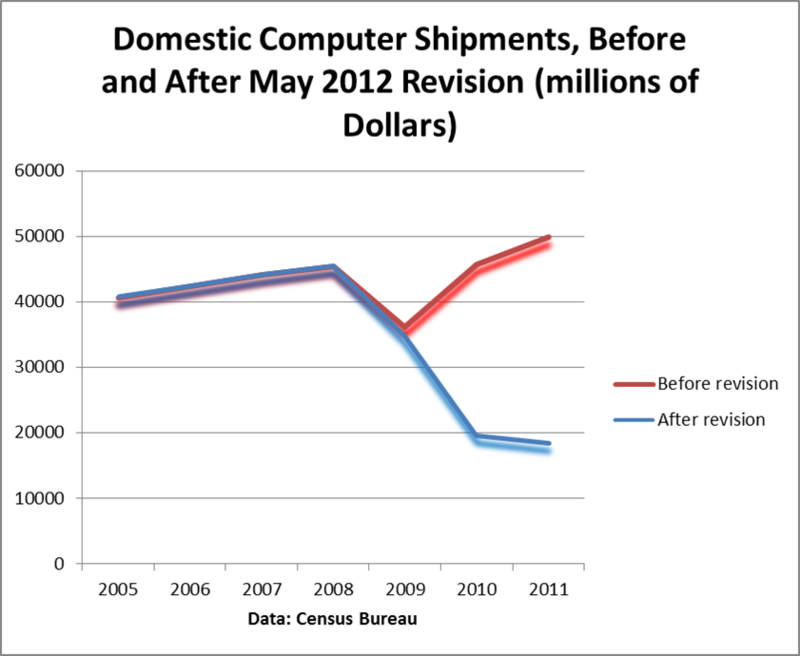 Final sales of domestic computers, adjusted for price changes, were supposedly up 94% since 2007. Now, these numbers always seemed a bit suspicious to me. I mean, every computer that I ever picked recently was made overseas. So the idea that domestic computer manufacturing was thriving seemed off. Now the statistical agencies have finally come to the same conclusion. 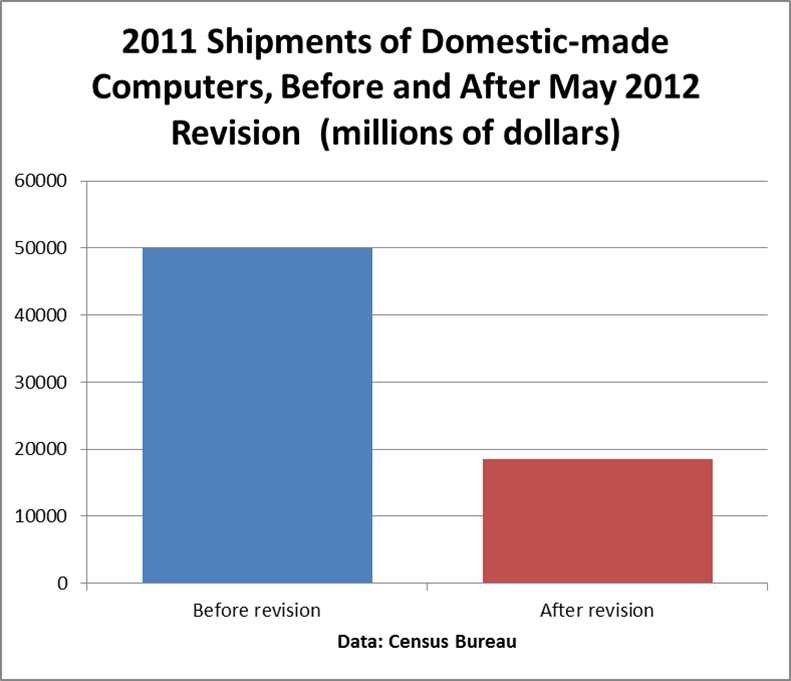 Based on the results from the 2010 Annual Survey of Manufactures, the Census Bureau on May 18th revised shipments of domestic-made computers down–way down. Shipments of computers from domestic factories in 2011 are now being reported at only $18.5 billion, almost two-thirds less than the previous 2011 figure. Take a look at this chart. Here’s another way of looking at the revision. The top (red) line tracks domestic computer shipments before revision, and the bottom (blue) line tracks after revision. These numbers are not adjusted for price changes. If I adjusted for the price drop in computers, final sales of domestic computers decline by 28% from 2007 to 2011, rather than rising by 94% like the pre-revision numbers showed. This is no ordinary revision. The sharp fall in price of computers, combined with the supposed growth of domestic computer shipments, gave computers on outsize influence on both manufacturing stats and the whole economy. There are four important points here. 1) A big chunk of those computer shipments were supposedly going into domestic nonresidential investment. Post-revision, either the U.S. investment drought was deeper than we thought, or imports of computers were a lot bigger (see the recent PPI piece on Hidden Toll: Imports and Job Loss Since 2007). 2) The U.S. shift from the production of tangibles to the production of intangibles (think the App Economy) has been even sharper and more pronounced than we realized. 3) Budget cutbacks for economic statistics, such as the House Republicans are proposing, would increase the odds of big revisions like this one. 4) Bad data leads to bad policy mistakes, especially at times of turmoil. We need more funding for economics statistics, rather than less. How Many Manufacturing Jobs Does the App Economy Need? How many manufacturing jobs does the App Economy need? What would a ‘balanced’ U.S. economy look like? (Clue: It has more manufacturing jobs than we have now). Join PPI in DC on May 2 for what we expect will be a terrific event discussing these key questions. The event will feature myself presenting PPI’s new study, joined by Jared Bernstein of the Center on Budget and Policy Priorities, Leo Hindery of Intermedia Partners, and Louis Uchitelle of the New York Times. For details and RSVP for the event, see here. During the 2000s, as U.S. manufacturing was transformed by devastating job losses, prominent economists and presidential advisers offered comforting words. The paring of the manufacturing workforce, which shrank by a third over the decade, actually represented good news, they said. It meant that U.S. workers and factories had become more efficient and that, as a result, manufacturing companies needed fewer people…. ….But a handful of economists are challenging that explanation, chipping away at the long-offered assurances that the state of U.S. manufacturing is not as bad as employment numbers make it look. Instead, they say, it’s significantly worse. What caused the job losses, in their view, is less the efficiency of U.S. factories than the failure of those factories to hold their own amid global competition and rising imports. The apparent productivity gains reflected in the official U.S. statistics have been miscalculated and misrepresented, they say, a position that has been at least partially validated by recent research. Of course, readers of this blog will have guessed that the WaPo article draws heavily on research that I’ve been doing with Sue Houseman. This research was also cited extensively by Rob Atkinson in his new manufacturing report. …an important point is that while import price bias can produce granular statistics that do not measure what they claim to measure, they must do that at the expense of something else happening. So, for example, if proper accounting shows that the real value of an IPad is 70% foreign rather than 50% foreign, then something has got to go the other way to explain how 50% of the revenue shows up in Apple’s bank account after supply chain costs. Karl raises a good point, but the answer is simple. Remember that the BEA divides corporate profits into domestic profits and ‘rest-of-the-world’ profits. Domestic profits are counted as part of domestic income, but ‘rest of the world’ profits are not. Import price bias causes “too much” of corporate profits to be allocated to domestic income. Suppose that Wal-mart switches from a Japanese supplier to a cheaper Chinese supplier. That drop in import costs shows up as a gain in domestic profits, even though nothing has changed in the domestic economy. Moreover, we get a real gain in domestic profits even after adjusting for price changes, because of the import price bias. This is a fundamental problem with the economic statistics as they are currently constructed. We are trying to measure a cross-border global supply chain economy with nation-based economic statistics, and it just isn’t working. There is no easy fix. Sometimes when I write about the shift from the consumer economy to the production economy, people assume that ‘production’ equals ‘manufacturing’ . That’s just not true. So I asked Mary Adams of I-Capital Advisors, and co-author of Intangible Capital, if she would write a guest post on “The Post-Industrial Production Economy.” She graciously agreed, and here it is. In follow-up to Michael’s post on production vs. consumption economies, he asked me to take a crack at describing what the post-industrial production economy will look like. So here goes! We live at the cusp between the industrial and the knowledge eras. In the U.S., the shift is already very much underway. But there is still much change to come, including in the production economy. To understand what will happen, let’s first look at what happened during the industrial revolution. Yes, mass production and factories drove huge growth. But manufacturing was not the only part of the economy that was created or “industrial-ized.” Education was industrialized to provide large numbers of capable workers. Energy production was industrialized to provide cheap, available power for factories, homes and offices. Agriculture was industrialized to provide reliable, economical food sources. The change affected almost every corner of our society. This industrialization process occurred under a number of very simple conditions or design constraints. Some of the most important included the availability of relatively cheap energy, the relative lack of importance placed by society on externalities (such as pollution and health risks), the availability of large workforces and continued returns available from mechanization that provides greater and greater returns on the work of employees. These design constraints began to shift a long time ago in the U.S.For example, we have known for a long time that our patterns of energy and resource use were not sustainable. But rather than rebuilding or remaking our industrial economy, we chose to/had the opportunity to send much of it off shore. If you look at the rise of China in the last 20 years, you will see a replay of the industrialization process, not the end of it. The Chinese also know that the model they are imitating is not sustainable. But the Chinese have an opportunity to use the model to quickly raise the level of living of their enormous population and generating enough wealth in time to simultaneously invent a new model. Or to follow whomever can invent the new model. What will the new model look like? Moving into the knowledge era does not mean the rise of services and consumption and the decline of production. Humans will have the same needs to live. Housing, transportation, consumer goods, food, healthcare, education will all remain constants in our economy. These needs require a production sector. But this new production sector will be built under a new set of constraints. It’s anathema in many economics circles to speak ill of international trade. Indeed, I am not even willing to go that far. What I am saying is that the story of this recession is a part of the larger story of globalization and its effects on the U.S. labor market. Strong demand domestically and overseas has kept U.S. factories humming, making manufacturing one of the strongest sectors of the economy since the recession ended in June 2009. “Humming”? There is no sense in which U.S. factories are “humming”, unless you consider being buried underground the same as being aboveground. 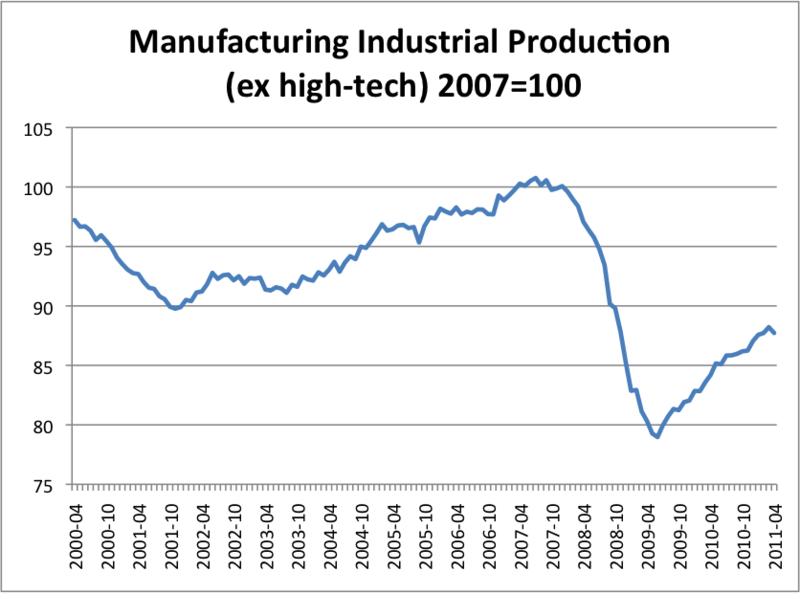 Industrial production of manufacturing, ex high-tech, is still 12% below its 2007 level. (see chart below). Total manufacturing is about 9% below its 2007 level. And last time I looked, manufacturing employment was still down 2 million jobs. Argue if you want that manufacturing is not essential–I don’t agree, but at least it’s a position. But don’t engage in Orwellian double-speak by saying that U.S. factories are ‘humming’.